Distribution Industry; Received the 2018 Edward J. Glueckler Award. Scottsdale, AZ – President of International Aircraft Associates, Mitch Weinberg received the 2018 Edward J. Glueckler Award. As the recipient during the 20th year of this award presentation, Mr.Weinberg led the distribution community in the uniformity and reduction in unnecessary documentation requirements; a regular speaker at industry events; promoted access to finance for the aftermarket community; and tirelessly served as an ASA Director for twenty years. “Mitch exemplifies a commitment to the industry and ASA. 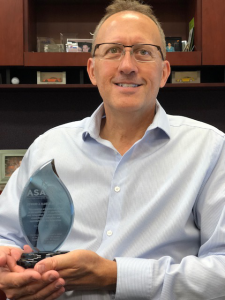 His passion for aerospace business growth can be seen in his work with the South Florida Aviation Maintenance Council and Greater Ft. Lauderdale Alliance with an eye on assisting small aviation companies thrive,” said ASA President, Michele Dickstein. Named for the founder and first President of the Aviation Suppliers Association, The Edward J. Glueckler Award is presented each year at the conference in recognition of outstanding commitment, dedication and contribution to ASA and the aviation industry. Congrats to Andy Weinberg for winning the “Sales Beast of the Month” award for his great efforts in October 2018! Congrats to Gary Pattek for winning the “Sales Beast of the Month” award for his great efforts in September 2018!